Nadiya Petrenko studied at the Lviv Academy of Music (Ukraine), Moscow Academy of Music (Russia), and Princeton University (USA). She also furthered her studies with Maestro Angelo Bertacchi, Katia Ricciarelli, Maestro Walter Coppola, Gioacchino Gitto in Italy. Nadiya Petrenko started her career in Ukraine: she was first soloist with the Philharmonic Orchestra of Crimea (Yalta), first soloist for the Radio State of Ukraine in Kiev, first soloist for the National Hall of Concerts in Kiev and first soloist of the Opera Sperimentale Theatre of Kiev. In 2000 she moved to Italy. Amongst the roles Ms. Petrenko debuted in Italy are: Madlon (Andrea Cheniér) at Lecce, Brescia, Bergamo, Pavia and Cremona; Santuzza (Cavalleria Rusticana) in Cremona; Fenena (Nabucco) in Bassano del Grappa Jesolo – in 2004; Amneris (Aida) at Raggio Calabria; Verdi’s Requiem in Florence; Maddalena (Rigoletto) in Cremona, Pavia, Bergamo,Brescia and Como – in 2005. 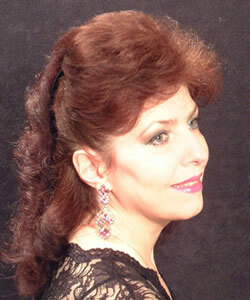 In 2006 she sang Mozart’s Requiem at the Teatro Comunale of Fano; Emilia (Otello) in Rovigo, Bolzano, Rimini, Ravenna; La Principessa (Adriana Lecouvreur) in Neustrelitz (Germany) and Berlioz’s Cleopatra in Narni. In 2007 she sang Maddalena. (Rigoletto) and Amneris (Aida) at the Narni Opera Festival; Preziosila( La forza de destino) in Malta; In 2008 Dama (Macbeth) in Cremona and Brescia; Rosenkavalier at Carlo Felice di Genova, Dvorak’s Stabat Mater – Cremona, G. Mahler – Das Lied von Der Erde – Portogruaro, G. Puccini – (Gianni Schicchi), G.C. Menotti – (The Medium) – Cremona, Brescia, Como, Pavia. In 2009 Maddalena (Rigoletto), Zita (Gianni Schicchi) – Lecce, G. Mahler – Lieder eines Fahrenden Gesellen – Portoguaro, V. Bellini – Norma ( Clotilde) – Pisa, Pavia, Brescia, Cremona, Como, Trento. In 2010: Amneris (Aida) – G.Verdi – Forli; Mahler’s 8th Symphony – Wismar (Germany); V.Bellini – Sonnambula (Teresa) – Cremona, Brescia, Como, Pavia; Schubert’s 5th Mass – Cremona; In 2011 Mercedes (Carmen) – Bizet in Trento. Ms. Petrenko is winner of various competitions and recipient of many prestigious awards: First Prize Winner of X Concorso Internazionale “Riviera della Versillia”, Italy (2000), Third Prize at the Concorso Internazionale Lirico “Rolando Nicolosi”, Italy (2000), Third prize at the Concorso Internazionale “Arenano 2001” (Italy) , First prize at the Concorso Internazionale Lirico “Nino Carta” Moncalieri (Italy). Ms. Petrenko began teaching four years ago. Her school of singing puts focus on precise breathing technique, mouth position, singing in the mask and more. In recent years her students have started singing at important venues around the world and are winners of important competitions. Amongst her students are Tsakane Maswanganyi, Beatrice Greggio, Inga Lisa Lehr, Giorgia Bertagni, Dianna Trivellato, Alessandra Caruccio, and Silvana Benetti.